RRB Secunderabad Group D Recruitment 2018-2019 is available for 6523 Grade IV Vacancies. Recently, the organization of Railway Recruitment Board Secunderabad had released the Official RRB Secunderabad Group D Recruitment 2018-2019 Notification. So, all the candidates belong to Telangana State now check and apply for RRB Secunderabad Group D Jobs 2018-2019 before 31st March 2018. Moreover, all the contenders need to submit their Online Application Forms before the deadline. We all know that the authority of RRB Secunderabad is planning to select the suitable contenders for 6523 Posts. Therefore, rrbsecunderabad.nic.in Grade IV Vacancies is the great opportunity for the people. So, we, suggest the candidates do not worry about Application Process details, Selection Procedure, Salary, Application Fee, Education Qualification and complete steps to apply for RRB Secunderabad Group D Openings 2018-2019, etc. Because we have arranged all the information here. Also, check the rrbsecunderabad.nic.in constantly. According to the official Notification, all the aspirants should have Minimum 18 Years and Maximum 31 Years. So, the organization is strictly stated that only candidates in between 18 to 31 years are eligible to apply for RRB Secunderabad Group D Recruitment 2018-2019. And coming to the age relaxation details, many of the candidates are waiting to know the Age Relaxation details. For those people, our major suggestion is to check the Official Advertisement which is available at the bottom of this article. Moreover, we have connected the direct Notification in a PDF format. 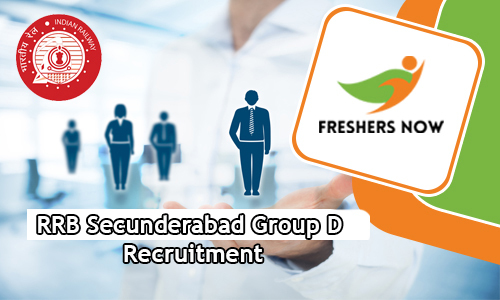 Therefore, interested competitors can check it from the below and find more news about the RRB Secunderabad Group D Job Openings 2018-2019 for 6523 Grade IV Vacancies. Follow the next sections attentively and get the entire details. RRB Secunderabad is officially announced that they are decided to select the suitable aspirants for 6523 Track Maintainer Grade IV (Trackman), Gateman, Pointsman, Helpers in Electrical/ Engineering/ Mechanical/ Signal & Telecommunication departments, Porter & Other (Grade IV) Vacancies. Also, to this, all these posts come under Grade IV. Therefore, those who are looking for Railway Jobs and Telangana Govt Jobs can apply for RRB Secunderabad Group D Recruitment 2018-2019 by referring the eligibilities which we have given in this article. And also, all the applicants must have perfect Education Qualification. 10th class or ITI or its equivalent from NCVT or SCVT in India is the essential qualification for all the job hunters. So, those who had the mentioned eligibility can proceed to check the further updates. Keep in mind that, the organization didn’t consider any applications. Another mandatory information is Application Fee. Well, many of the candidates are referring the official RRB Secunderabad Group D Recruitment 2018-2019 Notification to get the Fee information. Moreover, Rs. 500/- is the application fee for all General Candidates. So, other people need to pay Rs. 250/- as the Application Fee. Everyone knows that the Application Fee varies from category to category. So, check and pay the fee as per your category. Once go through the official Advertisement before paying the fee. And some at the time of proceeding, you people must and should follow many instructions. So, verify the details twice or trice and proceed. Along with the current article also visit the official web portal rrbsecunderabad.nic.in usually to find the details. And also, all the candidates who got placed in RRB Secunderabad can get an attractive pay that is Rs. 18,000 per month. The post wise vacancy details for 6523 Grade IV are available in the below section. Meanwhile, in the official RRB Secunderabad Notification 2018, the department specified that the selection is based on a couple of recruitment rounds. Written Test (Computer Based Test), Physical Efficiency Test (PET), Document Verification and Personal interview are the selection rounds that all the applicants need to clear. So, we are insisting the people that the competition is very high. Without checking the Syllabus and Previous Year Questions Papers, it is tough to clear the written test. So, we have given the complete material on our website for the sake of candidates. Hence, after completion of application process start your preparation by visiting our website. The Minimum and Maximum age are available in this section. Also, the age relaxation is applicable. At the time of applying the RRB Secunderabad Group D Recruitment 2018-2019, you have to follow few steps which are available in this section. So, all the candidates can start their application process immediately as soon as possible by following the below steps. Before submitting recheck and apply before the last date. Therefore, all the eligible aspirants are suggested to apply for RRB Secunderabad Group D Recruitment 2018-2019 before 31st March 2018. Follow our website Freshers Now frequently. 10th pass. any rrb jobs? I am passed 10th. B.com degree completed. Am i eligible to apply for RRB group d Secunderabad recruitment?